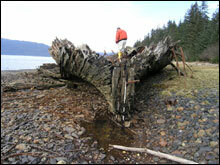 From April 4-12, 2006 the Office of History and Archaeology, Alaska Department of Natural Resources collaborated with scientists from the NOAA National Marine Sanctuary Program, the University of Alaska Fairbanks, the University of Rhode Island, and the U.S. Minerals Management Service to collect baseline information on several historic shipwrecks in Southeast Alaska. These included the Princess Sophia, Princess Kathleen, Clara Nevada, Griffson and Islander. The work was conducted under a grant to the Office of History and Archaeology from the NOAA Office of Ocean Exploration. Archaeological and historical resources on state lands, including tidelands and submerged lands, are protected under state and federal laws. During the April project, divers Dr. Stephen Jewett University of Alaska Fairbanks, Dr. Hans Van Tilburg NOAA National Marine Sanctuary Program, Dr. John Jensen University of Rhode Island / Sea Education Association, and Dave McMahan State Archaeologist Alaska DNR, collected biological and archaeological data on the condition of the shipwrecks and their locations. These “snapshots in time” will allow future studies to better understand changes that are occurring due to natural and cultural processes. The divers also placed small markers near the sites identifying their protected status. Dr. John Kelley and Dr. Sathy Naidu, both of UAF School of Fisheries and Ocean Sciences, analyzed trace elements from surrounding sediments, contributing to our understanding of coldwater deterioration and effects of the wrecks on the marine environment. Other participants included Mike Burwell shipwreck historian, U.S. Minerals Management Service and Ed Grossman former U.S. Fish and Wildlife Service Dive Safety Officer. Work was conducted from the U.S. 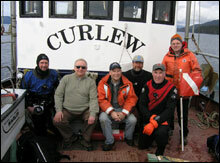 Fish and Wildlife Service vessel CURLEW, skippered by Captain Joe McClung. The passenger liner Princess Sophia was lost during a violent storm on Vanderbilt Reef. On October 24, 1918 an estimated 350 passengers and crew, including many of the Yukon’s leading citizens, were headed south from Skagway for the winter. Initially stranded on the rocks, conditions on Lynn Canal were too rough for rescue vessels to approach, or for the ship to launch her own lifeboats. Suddenly she began to slide into deep water, taking all on board with her. The wreck now rests in the dark green depths on a slope in 80-150 feet of water. Another Canadian Pacific Railroad liner, the Princess Kathleen, grounded on Lena Point during a fierce squall and sank northwest of Juneau on September 7, 1952. Fortunately the over 400 passengers and crew were able to climb ashore with no loss of life. The massive ship now rests on her port side in around 80-140 feet of water. Like the Sophia, limited visibility and strong currents frequent the wreck site. 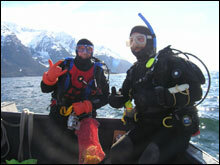 Located relatively close to Juneau, the site is a popular recreational dive destination. The dive team conducted a brief examination of the wreck, and also obtained high resolution sonar images with high frequency Didson equipment. The team also recorded the sites of the steamer Islander and the massive salvage bark Griffson on the shore at Green Cove. In 1898 the Islander, once the presumed unsinkable steel hulled flagship of the Canadian Pacific Navigation Company, struck a submerged rock or iceberg while steaming at 15 knots and went under in less than 20 minutes. Numerous attempts to salvage the wreck were made, but it was not until 1934 that the remains of the Islander were raised from 300 feet. Both the Islander and the Griffson now rest ashore. The Klondike gold rush steamer Clara Nevada has special significance for NOAA and the Office of Coast Survey, for the ship was formerly the Hassler, a U.S. Coast and Geodetic Survey vessel built in 1872 and named after that agency’s first superintendent, Ferdinand Rudolph Hassler. The ship hosted famed naturalist Jean Louis Agassiz on expeditions around Cape Horn and into the Pacific. Later she spent many years hard at work conducting hydrographic survey in Alaska. It’s not clear how the 150-foot vessel, then owned by the Pacific and Alaska Transportation Company, was lost. Heading south down Lynn Canal from Skagway in 1898, witnesses reported seeing a bright orange fireball, then a ship burning near Eldred Rock. 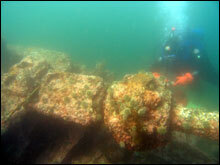 Further research on the wreck site and clues to the circumstances of her loss await future dives. Promoting the heritage preservation ethic goes hand-in-hand with these initial archaeological surveys. The team held two outreach events, presentations at the Sheldon Museum and Cultural Center in Haines and at the Mendenhall Glacier Visitor’s Center in Juneau, including digital images, underwater video and site sketches, and descriptions of other Pacific maritime projects. All of these wrecks capture the maritime nature of Alaska’s coastal history in the days of steam propulsion and the inherent hazards of navigation at 60 degrees north. This project represents a small step towards inventorying and documenting that fascinating maritime heritage. Alaska has almost half the nation’s coastline and several thousand known shipwrecks, but has no dedicated program for managing maritime heritage sites either in government or academia. The NOAA’s Office of Ocean Exploration and the National Marine Sanctuary Program are proud to play a role in assisting these maritime heritage preservation efforts.